... and the 64-bit architecture in the A7 is a completely different story. Apple wasn't first to market with 64-bit because they had an accelerated development schedule compared to other chipmakers. Apple was first to market because they started development first, ahead of everyone else. 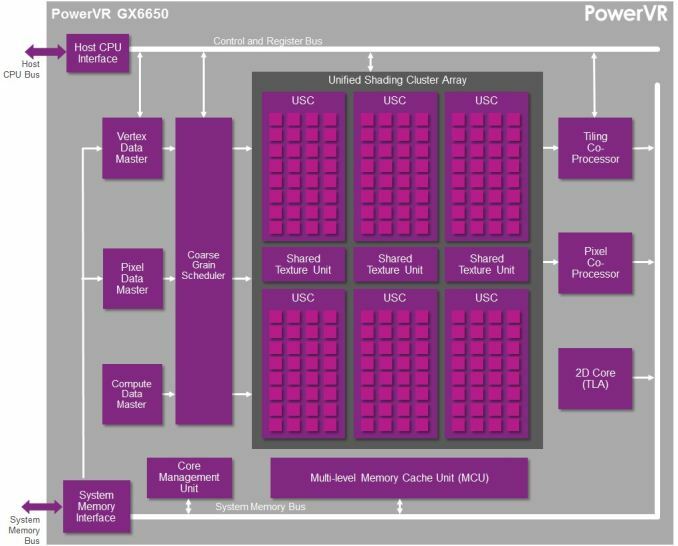 Considering the highly parallel nature of graphics processing, PowerVR's low core count and non-linear arrangement will make then weak in real-world gaming but strong in synthetic GFLOPS since their cores are stronger. Your example is irrelevant since ATI has no mobile solution and PowerVR has been the strongest in real world gaming since, well, until the K1 ships, PowerVR has had no real competition. And what chip is using a GX6650 GPU? None existing that I know of. Apologies, you weren't responding to my comment. I was wondering why it made no sense in the context of what I said. So they have 2x Float32 ALU cores, 4x Float16 ALU cores, and a SFU core. This has no mention of Integer cores. Am I to assume that integers won't run on the F32/F16 cores but instead of the SFU core so using integers will be 1/6th the speed of floats?